This is not an opening. 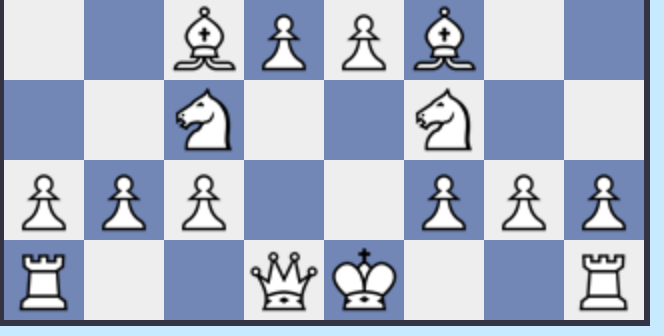 This is an "idealised" set up for the white pieces which is unlikely to be possible in a normal game unless black plays something like the Hippopotamus opening. I put "idealised" in quotes because there is really no such thing as a universal ideal white set up. White's best set up depends on where black puts his pieces. All openings are a struggle to make your pieces "good" and your opponent's "bad". This is not an opening but rather a set-up. I believe it is called by many as a bull head set up. Sorry, but that isn't an actual opening. That is a diagram that demonstrates the "ideal position" for each white piece. An opening involves both White and Black moves, and the Black player has a lot of influence over which opening ends up being played. For example, the White player may start with 1. e4 and an opening in mind, but it is the Black player who decides if he is responding with 1. .. e5 or 1. .. e6 or 1. .. d6 or 1. .. c5. What factors define changing popularity of different Openings over time? Is this knight sacrifice a good idea?